The US Embassy’s public diplomacy wing screens a film every Friday at the city’s American Library (conveniently hosted by my university here, Kyiv-Mohyla Academy). A contact of mine asked if I could fill in for a diplomat this evening, and I took the opportunity to show 12 Angry Men (1957). The film follows twelve jurors as they deliberate over the life of a teenager accused of stabbing his father to death. An open-and-shut case, all but one thinks at first. One man wants to get to his baseball game; one can’t wait to put the rotten kid down; all of them are tired of six days of trial and want to get the voting over with. And then there’s one who thinks they should at least think over the facts of the case before sending him to his execution. The men at the start of the film are not angry in the least. The anger first comes from the unsettling suggestion that to pass judgment without the use of reason– on the basis of unreasoned opinion– is irresponsible. It flares as the men realize that some of their fellow jurors do not wish to consider the evidence at all– that they are not just irresponsible, but immoral. It erupts when they realize that some members of the jury cannot reason at all– that some might wish for the boy to die to satisfy some passion within themselves. Not just one of the best American movies ever made, 12 Angry Men also provides a gateway to political philosophy. The phases of the film’s ethical dilemmas match Nietzsche’s broad sketch of the history of morals: first consequentialism, as appeals are made to weigh the physical death of the accused teen; then intentionalism, as the jurors question why they should care about the trial or death at all; then pre-morality, as the room discovers that the internal struggles of some jurors constrict their ability to reason at all. The man whose dignity rests on his sense of intellectual superiority, the dweeb who lacks the confidence to think for himself, the fast-talker afraid to break from his cynicism, the failed father who masks his shame with anger toward all youth. Yet the film presents a challenge to Nietzsche’s nihilism: the one man who compels the room to question the case and ultimately themselves does so not by compulsion, but by his example of an honorable man. The appeal to reason, with a great deal of effort, overcomes the reasoned argument against reason itself. 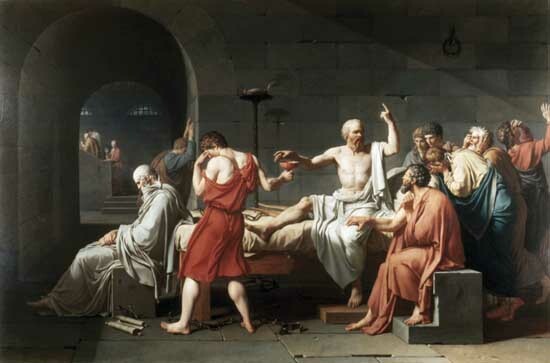 Through the presence of a Socrates in the room, we are able to see that it is Socrates who is again on trial. I introduced the film by explaining that the original screenplay came around in 1954, the height and beginning of the descent of McCathyism. Literally: just take a look at the poll midway or so down the Wikipedia page (fully cited here, of course). The question debated in American society at the moment centered on fear of the Soviet Union and how to confront those demagogues who would use that fear to debase the principles of American society. The play and film suggest a deeper problem: the true thing to fear is apathy toward justice, an enemy within rather than without. It is a deeply Greek notion. Showing this to a Ukrainian audience proved to be an enlightening experience for me. First, I was reminded once again how incredibly well many university students speak English, something that should not surprise me given how common life-long English instruction is around the world, but which nonetheless reminds me how inept Americans tend to be with foreign languages (a trend that I think has started to change for the better). Second, and more importantly, they offered extremely insightful comments and analysis. It was very clear that the men’s prejudice undermined the jury; it was even clear to some that apathy of this sort threatens the justice system. One woman caught the Cold War undertones (I totally mentioned McCarthy during of my introduction); one amazing gentleman suggested that Henry Fonda’s role as producer confirms the film’s humanitarian undertones. One student told me she had read the play in a drama class, and played the role of the defiant juror. Another brilliantly pointed out that each juror represents a particular human type (a notion that implies much about the need for philosophers to have courage). I was deeply impressed. I enjoyed explaining jury duty to the audience. One student asked me if everyone in the room was a lawyer. “Nope, all citizens can be randomly selected to serve for jury duty. It’s not considered a desirable thing to receive.” Another asked if everyone in America really does this at some point or another. “It really is random, so most people will probably serve at least once in their lifetime, yeah.” The first student followed up, “maybe they should be lawyers.” I could interpret this in two ways: the jurors in the film did a far better job than the prosecutor or the defense (who, who are made to understand, is a public defendant: one of the most overworked, underpaid, under-appreciated professions in America). Or perhaps he meant that a process like this should not be left up to ordinary citizens. The film does indeed raise that question. But then, we are made to understand that the lawyers did no better job. Reason need not be the domain of any one profession, regardless of its reputation: the true ranking of a citizen is reasoned commitment to a just society. And he was right. This was an ideal, and one that brings a sense of shame upon realizing that we probably do not live up to it. But whereas Soviet propaganda would have presented this ideal as reality, the film allows the reader to realize this hangs above reality, as an idea to stretch toward. Like I said, it is Greek to the core. On a final note, a number of students told me about a Russian film called 12 (2007) by Nikita Mikhalkov. It’s a Russian version of the the American classic, in which a jury deliberates the fate of a Chechen teenager accused of murdering his stepfather. It is political in a rather different sense: 12 Angry Men took place entirely in a jury chamber, removed from the necessities of political life. 12 remains deeply mired in the violence and complications of the Russian conflict in Chechnya. That is all I can say for now, but I very much look forward to seeing the remake. Next week I am hosting a conversation group on the recent U.S. elections with a Fulbright-Hays doing research for her dissertation in Kyiv. I expect that entry, regrettably, to be far less philosophical. This entry was posted on November 12, 2010 by Zach. It was filed under Uncategorized . Well, this was a wonderful entry! I noticed a typo, but you’re forgiven. Why did you never mention this movie to us? Sure, it’s in peasant-vision, but that clip was gripping. Slipped my mind! But I highly recommend it. Very few movies can take place pretty much entirely in one room and rely almost completely on dialogue.